Welcome to Crac’h in Le Morbihan (56) to the 3 Star Camping du Fort Espagnol. Camping Fort Espagnol welcomes you to stay on one of its 215 camping pitches in a green setting where the smell of the pines and oak trees mingles with the shade and brightness. Our 3 Star campsite near to Carnac is open from 5th April to 30th September and is pleased to welcome you from 8-30am to 12-30pm and from 2-30pm to 6-30pm. The site welcomes you for your holiday on the Brittany campsite with a choice of : Spacious and private camping pitch OR Mobile home, Chalet cottage, Sahari lodge, Tzygane Romany style caravan Holiday for all on a nature theme. Whether you have a preference for camping or for luxury accommodation, you will find what you wish for at the Camping Fort Espagnol, thanks to its 70 spacious, private and marked out pitches or in one of the 110 luxury and fully equipped rental properties made for a successful holiday. Choose the accommodation which suits your budget and book at the best price from our website (ANCV and VACAF holiday cheques accepted). The campsite is ideally situated by the sea, 2,800 metres from fine, sandy beaches and 800m from the Crac’h town centre. Crac’h is a small, typically Breton township in the Morbihan “departement” with all necessary businesses (baker’s, patisserie, butcher’s, restaurants, creperie, supermarket, small shops….) Come and recharge your batteries and enjoy a moment of relaxation on our campsite. Close to the campsite you can discover the Golfe du Morbihan and its famous seaside resorts : Quiberon Carnac Baden Vannes for your afternoon shopping Campsite near to Carnac with a pool At the Camping du Fort Espagnol the pool area is open to all. Open throughout the season from 10-00am to 7-00pm. The water in the pool is heated. Come and enjoy a swim in the pool on your own, with family or friends. The campsite’s pool complex is composed as follows: An outdoor heated pool A paddling pool for the enjoyment of the little ones A Jacuzzi whirlpool Water chute and slide Sun loungers for your afternoon relaxation and sunbathing around the pool Covered, heated pool with its spa area Choose Southern Brittany as your next holiday destination Exclusive to Crac’h in Le Morbihan: Come and discover and enjoy our covered, heated pool – brand new as work carried out in 2012. Lively campsite with a wide range of amenities Throughout the season Camping du Fort Espagnol offers a broad program of entertainment and activities for all. Themed evenings are regularly organised, play activities in the pool for adults, or also THE FREE CHILDREN’S CLUB for the delight of the youngsters. For an unforgettable stay, the site has a range of amenities: cycle hire, postcards, mail service, etc…. To advise you in your choice of tourist visits, Reception offers you leaflets, brochures and a lot more…. We personally did not like this campsite and were glad we only stayed 2 nights. It felt very tired and run down and the toilet / shower facilities were too basic. Cold building and the water was lukewarm. No electricity plug points provided for hairdryers. Did not use swimming facilities to comment upon. Location of campsite was ideal for a stopover near Roscoff for the ferry and in our favourite part of Brittany. Our pitch was large and open which was an improvement to other smaller pitches we had during our 3 week holiday. For a large twin axle caravan this has been an issue in France. No waste water disposal provided. Informed to dispose on pitch. pool, and the staff . Einfahrt Parkplatz sieht nich Einladend aus.Veraltete Wege Erneuern . Englisch Kenntnisse in Rezeption. Wasserablauf bei Starkregen fehlt . Schwimmbad , Rutschen , Neue Toiletten und Duschen Anlage. Hecken und kleine Abtrennung zum Nachbarn.Wasser nach Regen sickert gut weg. kein kostenfreies WLan im Mobilheim, Terrassenmöbel sehr dürftig, Betten zu schmal, mindestens 160 cm wäre besser. Les allées non goudronnées qui génèrent beaucoup de poussière. L'emplacement du camping, centré dans le Golf du Morbihan. 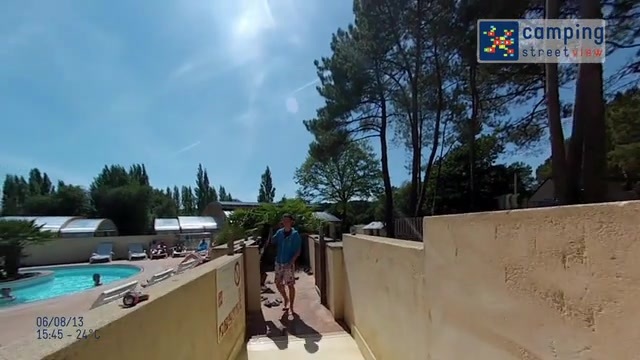 La piscine couverte du camping. Le camping est bien situé. Il permet un accès rapide à beaucoup de choses à voir. Un peu trop rapproché des autres et surtout pas très propre. Notamment les équipements extérieurs.